Make vocabulary crossword puzzles and word searches quickly from your own words. Help your students learn vocabulary, reinforce facts, and prepare for exams. Most puzzles for the New York Times and other publications are made with help from the program. Get a full suite of professional tools. 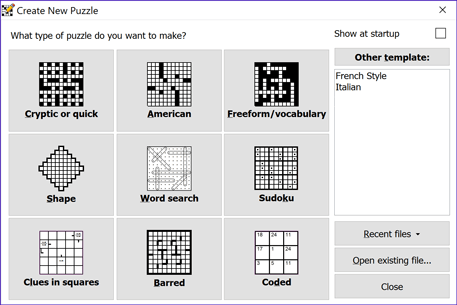 Your program is easily the best thing that has ever happened for crossword constructors. ..it's brilliant. As a teacher I use it at least a couple of times a week and the kids I teach love the crosswords. I've tried several crossword "builders" and your product is light years ahead of the closest competition. It combines enormous configurational flexibility with simplicity of use... it is a real bargain. ...it's utterly sensational... This has got to be among the greatest shareware programs ever made. You must have this software. A constructor's dream come true. Many new features and enhancements, see What's New.